Jenn Callewaert and the Clinton-Massie girls are in good position to win the SBAAC American Division championship Saturday. 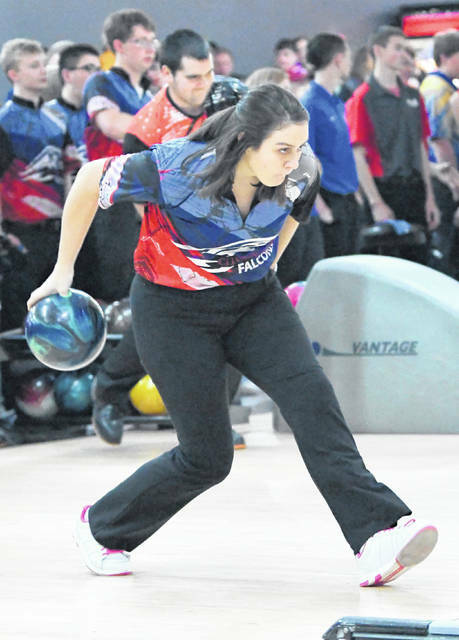 Wilmington’s boys and Clinton-Massie’s girls are in the hunt for SBAAC bowling championships when the conference tournaments get underway Saturday at Royal Z Lanes. The National Division tournaments, which includes East Clinton and Blanchester, will begin at 9 a.m. Saturday. The American Division tournament, with WHS and CM, will follow at 1 p.m.
Clinton-Massie is the host school. The tournament is open to the public. WHS and Western Brown are 1-2 going into the boys tournament. The Hurricane has one loss through the regular season while Western Brown has two losses with one regular season match to go against New Richmond. The Broncos defeated the Hurricane Monday, a result “that tightened things up,” Fisher admits. Wilmington finished second to Clinton-Massie in the 2018 SBAAC tournament. On the girls side, the Lady Falcons have a two-game lead over Goshen going into the tournament. The goal is simple – finish ahead of the Lady Warriors and win the title. Wilmington is third in the standings at 5-5. On the National Division side, the Blanchester and East Clinton boys and girls are out of contention. The Blanchester boys are 5-7 and the East Clinton boys are 4-8. Clermont Northeastern leads the division at 12-0. The girls race has CNE and Williamsburg both at 11-1. Blanchester is 6-6 and East Clinton is 5-7.